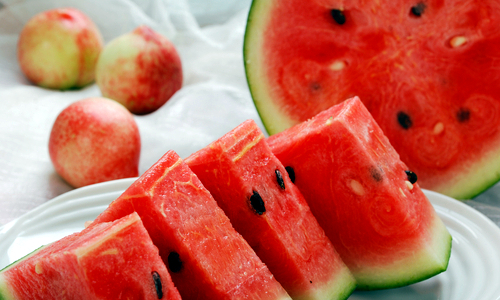 Extract the juice from watermelon and peaches, saving pulp. Boil pulp into five quarts of water for 1/2 hour then strain and add water to extracted juice. Allow to cool to lukewarm then add water to make five gallons total and all other ingredients except yeast to primary fermentation vessel. Cover well with cloth and add yeast after 24 hours. Stir daily for 1 week and strain off raisins. Fit fermentation trap and set aside for 4 weeks.